You may remember this house when it was under construction as shown in this post. 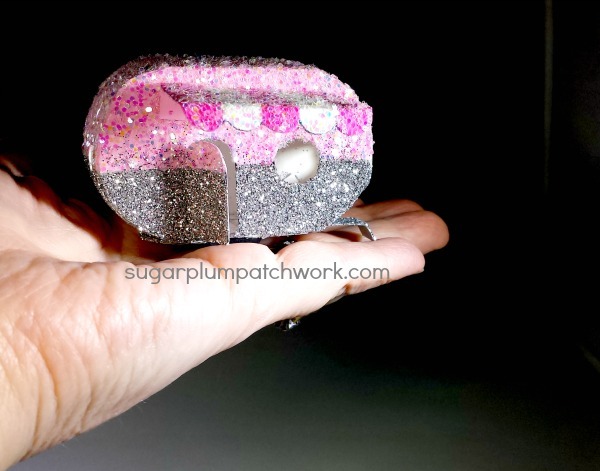 Here it is all frosted with glitter. The paint color is called "melon pink" but it looks orange. I so like the contrast of the gray for the roof and fence. This is an original pattern I made after being inspired by so many cute houses with towers on the internet. Now how about something that IS pink? 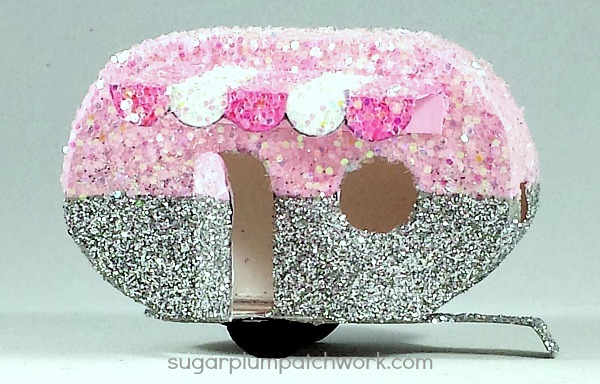 And how about a glitter CAMPER? This is a pattern from Kelly Vivanco that I found online. Here is a link to it on Pinterest. This one has been a bear to photograph. I have struggled to get the lighting and the angles right. You can see the shape well in these pics, but he pink is much more vibrant in real life. The pattern has legs and a bottom strip for the awning, but I felt like that obscured the front of the camper too much so I left them off. One more for size reference. It's pretty tiny! The rounded edges were a new challenge and I think I would make some modifications to the pattern if I make this one again. 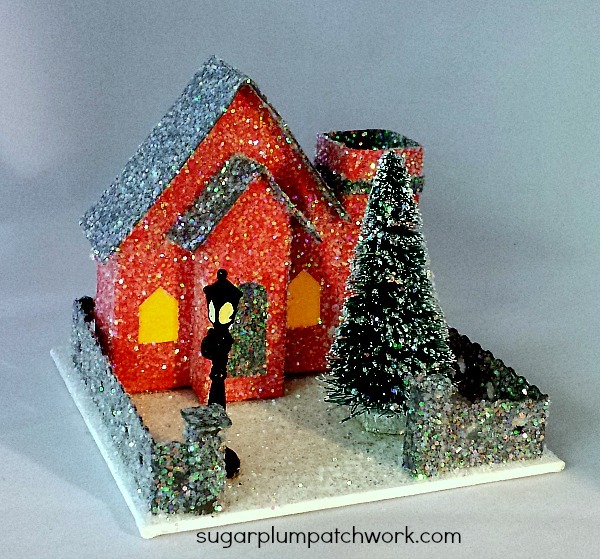 But I think it will be a sweet addition to our Christmas Village this year. 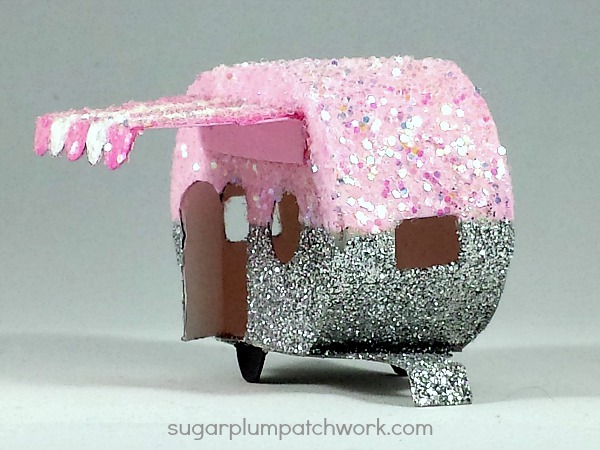 Oh my gosh - so lovely and this camper is such an adorable little treasure! AMAZING! Oh, I love these. The little house with the grey roof is wonderful. 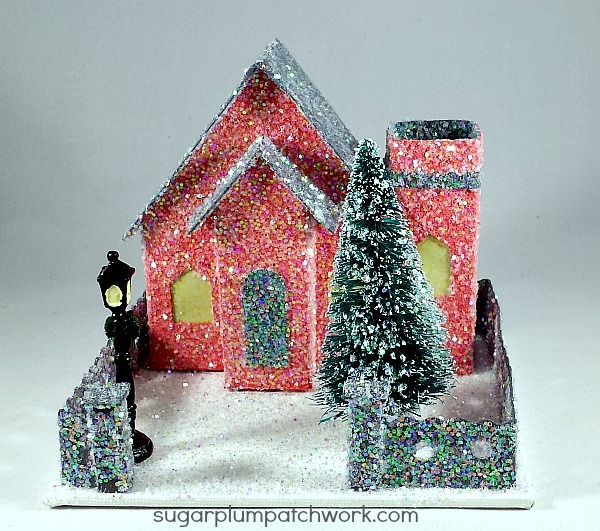 You put the colors together so nicely and the contrasting glitter on the fence is perfect. And the camper is a great addition to your growing village. gorgeous Laney- and that pink camper-too cute!! Happy PPF! Laney these are superb. That little trailer is the best. Your art is made of dreams. o what nice this is!!!!!! Fab projects...loving all the glitter! The camper is so great, what a impressive work !